Abbotsford Police Chief Bob Rich once again plays the role of Santa in the department's annual holiday greeting. This is the fourth year the APD has sent out Christmas cards to criminals and troublemakers, with the idea that they consider changing their lifestyle. Const. Ian MacDonald said 108 such cards have been mailed out this year, with a focus on problem and prolific property offenders and those involved in the Townline Hill gang conflict, which has seen two groups of young men in a violent battle for drug turf. MacDonald said the cards are sent out to encourage people who have made poor choices “to reflect on those decisions,” “to look in the mirror” and to choose a crime-free lifestyle. “We can all examine our lives and our choices and make adjustments that will be positive for us and those around us,” he said. The cards provide an APD hotline (604-864-4777) for individuals to call if they are willing to make a change. 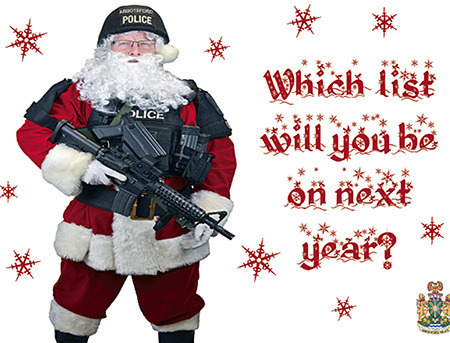 The program – called Operation Resolution – began in 2012 and sparked controversy and international media attention when the greeting card featured Police Chief Bob Rich dressed as Santa, carrying an assault rifle and wearing tactical gear.